Opened in 2008, the $13 million Sussex County Emergency Operations Center is an 18,000 sq. ft. facility that processes 911 and other emergency calls and links police, fire and country-state agencies. 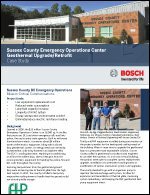 As a mission critical building, the options were open to complete system replacement/ upgrade, installation of a permanent cooling tower, or modification of various mechanical systems and upgrades. The county decided to go with an ingenious pump to injection thermal exchange well system, to allow for expansion and remediation of thermal glide, increasing system redundancy, and keeping the FHP geothermal heat pump equipment intact.